I like everything about my chairs! I like the timing also in receiving them! Safavieh Rural Woven Dining Pembrooke Natural Wicker Dining Chairs (Set of 2) - 20" x 22.5" x 41.5"
Add a touch of elegant, exotic style to your dining room furnishings with the Gaby Dining Chair by International Caravan Home Furnishings. This beautiful handwoven chair features a natural style and beautiful, long-lasting mahogany hardwood frame. The Gaby dining chair is a perfect standard size for most dining tables. Also, great for an accent or occasional chair. 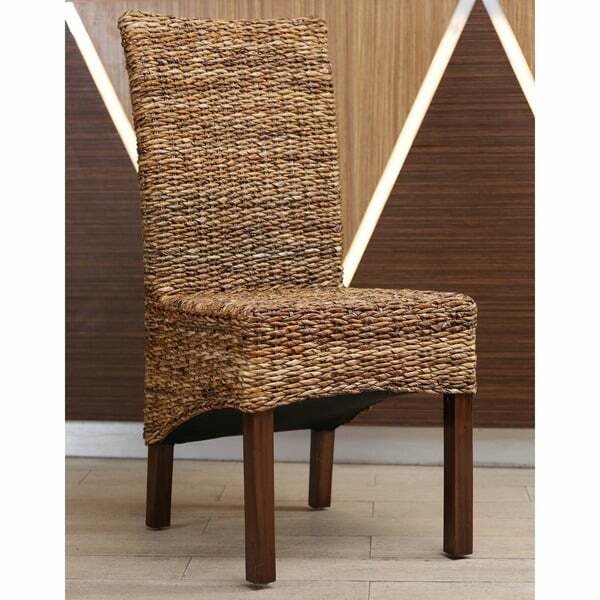 Whether you want to place the dining chairs with a table or want to let it accent your existing decor in whatever room, these chairs are the ideal solution due to their natural hand-woven abaca leave nature. I ordered 2 sets. I found cushions to fit them perfectly at Ballard.com. Beautiful chairs. Well made and sturdy. Seat is wide. Perfect. I ordered these chairs in the hopes that they would match four chairs that I got from Pier One.....sadly, they didn't. The quality of the "seagrass" is something that I've never seen before. Maybe that is what Abaca is supposed to be but to me, it felt like a coated plastic instead of anything nature. The chairs are, however, very stiff and sturdy, which my 75-year old mother likes. Saw these chairs at a nice furniture store at more than twice the price decide to try Overstock. So glad I did as I have to furnish an entire house and now relying heavily on Overstock because these chairs were beautiful. i love the look of this chair, with its natural beauty. its a little bigger than id like for my small kitchen table. Love these chairs! I ordered two sets. They are “deep” seated and comfortable enough to sit on without chair cushions. We tend to sit there often so I will purchase cushions. The only reason I didn’t rate 5 stars is because one of the chairs had a loose board under the seat. Nothing damaged and it was “fixable” without returning. 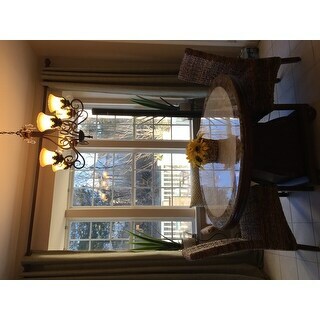 Bought these chairs to go with an existing table. They're beautiful and pretty substantial. Not sure if they would hold up under an obese person, however. Love these chairs! Well made and no wobbles on my hardwood floors. Price was great too. Sturdy and attractive. Not comfortable for sitting for a long period of time. Chairs look good from distance but quality is not the best. Lucky for me they are just for looks and aren't really going to be use for everyday use. Also packing material was stuck to all 4 chairs I purchased. Looked like vanishing was not completely dry before packaging. Overstock's customer care reps are awesome if you have a problem. I've been pricing this for sometime. I was delighted to find them at a discount! Though there weren't many reviews, the ones that had purchased, gave compelling reviews that suited me and my needs. 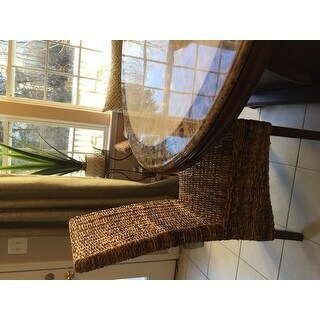 I'm trying to buy chairs to go with an existing table in our new home. I thought these would compliment the table and give the table a more casual vibe. "What are the differences between the International 'Gaby' and and the 'Arizona' Woven Abaca dining chairs? The description and dimensions are the same."